I know summer is coming to an end for most of the country, but here in San Diego, my favorite month of the year is coming up. September brings some great weather and the ocean water is usually at it’s warmest. I’ve tried to post twice a week since the beginning of summer and I’ve done so every week except for one! Regardless, I have another six weeks to hit the goals I set at the beginning of summer so I’ve joined the Yakezie Challenge. A blogging friend, Lance @ Money, Life and More encouraged me to join the challenge, so today I did! 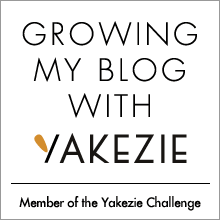 The Yakezie Challenge encourages bloggers to reach out to each other, promote each other’s posts and interact with one another in order to become top quality and high ranking blogs. Although the goal of the challenge is to improve your Alexa ranking, the best part of the challenge is the value placed on educating your readers and providing them with the best content possible, all for free 🙂 By completing the six month challenge, I would be eligible to join the Yakezie Network and have my posts promoted across a multitude of super successful personal finance blogs. In my opinion, the best thing about the challenge is the interaction between myself and other bloggers. Unlike most businesses, blogging is all about developing relationships with your competitors, promoting their brand and in return they promote yours. This is a novel concept, but I really enjoy reading other personal finance articles, and commenting and getting feedback on my own articles from like-minded individuals. I’m starting the Yakezie Challenge with an Alexa ranking of 871,822. I honestly have no idea if this is good or bad, but I’m going to lean towards average. I know there are millions, if not more, of sites out there, so at least I’m in six figures. If you’d like to follow along the challenge with me, you can download and install the Alexa toolbar here. It’s actually a pretty cool toolbar that will tell you the Alexa ranking of any site you visit(Google is number one). I’m sharing this post for two reasons. The first is to let the Yakezie members know that I’m entering the challenge and but I also want my readers to know that I’m very serious about producing the best content. I would never take this challenge on without the intentions of following through. Without a doubt, I expect to become a full time Yakezie member at the end of this challenge and I will do everything I can to continue to produce high quality posts. You can help me by sharing your thoughts through comments, e-mails or via FB/Twitter. Feedback from my readers matters to me so don’t hesitate to contact me. I will personally respond to each and every comment, tweet, message or e-mail. Very cool! Thanks for joining the challenge! You’ll learn a lot and benefit a lot especially if you are active in the forums. Let me know if I can help at all! Awesome, yea I’m definitely excited. I’ll definitely be posting on the forums and on other’s sites. Welcome to the challenge! Glad to have you! Good idea to join the challenge Harry. It is quite beneficial for most members. Personally I chose not to join the challenge since I don’t agree with some of the ways it is run. As long as you stay active networking with other bloggers I’m sure your blog will be successful. Thanks Harry. Luckily I have lots of website marketing experience that makes the challenge less necessary for me. Basically I was able to figure things out on my own and network without any rules forced on me. I was active on the forums for a while, but I was really just helping other people. Eventually the owner blocked me because he was bitter that I was using the forum without being a member. That guy is a tool lol. Jeremy, you crack me up man! If you’re willing to share your ideas with me I’d be willing to secede from the challenge and we could start our own rival blogging network haha! Trust me I’ve considered it, but that other owner is a real piece of work. I know he’d resort to all kinds of dirty tactics if he were my competitor. No I suggest you do take on the challenge and use it to your benefit. Actually, your rank is very good! The key to the challenge is networking and making genuine contributions to help others. Do that and the rest will take care of itself. Lance is a great guy and someone who definitely supports others. See you around the PF world! Yea I’m not super worried about my ranking and that’s definitely what I plan on doing. Thanks. Welcome to the challenge and best of luck. You will get to know a lot of awesome people. Thanks, yea I’m looking forward to interacting with some new people. Congrats on joining the challenge and welcome from a fellow challenger. Just be an sharing/commenting animal and you will be below 200k in 4 weeks. Let me know if you have any questions or if I can help in any way. Thanks for the tips. Will do!